The legend of Volquartsen preceded itself for this build and of course how could it not. Volquartsen has without question been the tip of the proverbial custom 10/22 spear since it first stepped into the .22 market. The company is also famous for revving up a number of other firearms, however almost everyone knows them first as a manufacturer of premium high-accuracy custom 10/22 parts. After two years being featured on the show Top Shot, I thought it was high time I did a Volquartsen 10/22 build to perform a couple of my own trick shots. Way back in 1974, the company was not really a company so much as a home based gun bluing operation. Today, a small basement run bluing operation has transitioned to a state-of-the-art computer controlled production facility producing not so subtle cutting edge firearm designs from 10/22s, to .22 pistols, ARs and more. 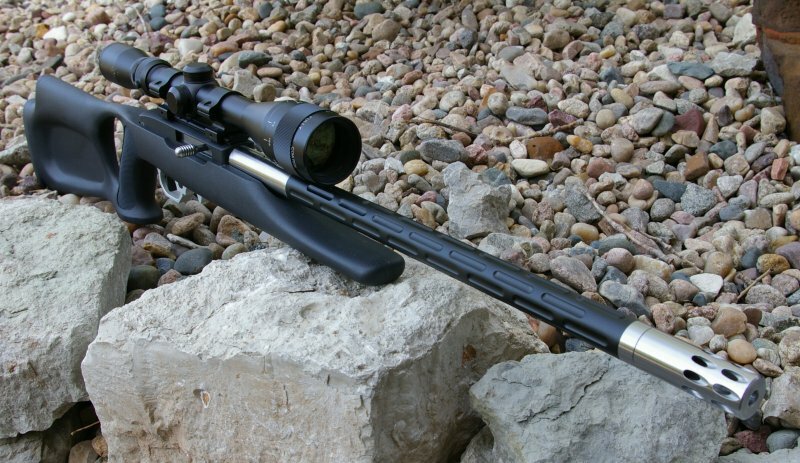 Arguably, I am sure someone could claim to be the first to develop some of the ideas Volquartsen has in their line such as tensioned barrels, carbon fiber sleeved barrels, insane fluting and ridiculously gorgeous anodizing, however Volquartsen was the first to bring it to the 10/22 market affordably. After we all saw those great Volquartsen colors and designs, a stock 10/22 was never good enough again. Volquartsen is not just making parts anymore, they now have their own line of firearms which range from customized versions of existing base firearm designs to designs which are functionally unique to the company. 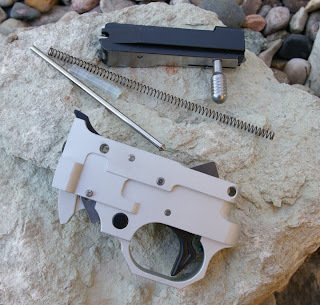 Swirly barrels, cool flutes, colorful anodizing, radical compensators and sci-fi stocks aside, Volquartsen is more than just gorgeous firearm and parts, what they are really famous for is stunning accuracy. 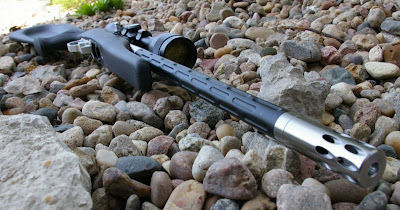 For this build I used a Volquartsen THM Tension I-Flute Lightweight 10/22 .22LR barrel with Forward Blow Compensator, CNC Machine 10/22 Bolt Group, and TG2000 Competition Trigger Unit. 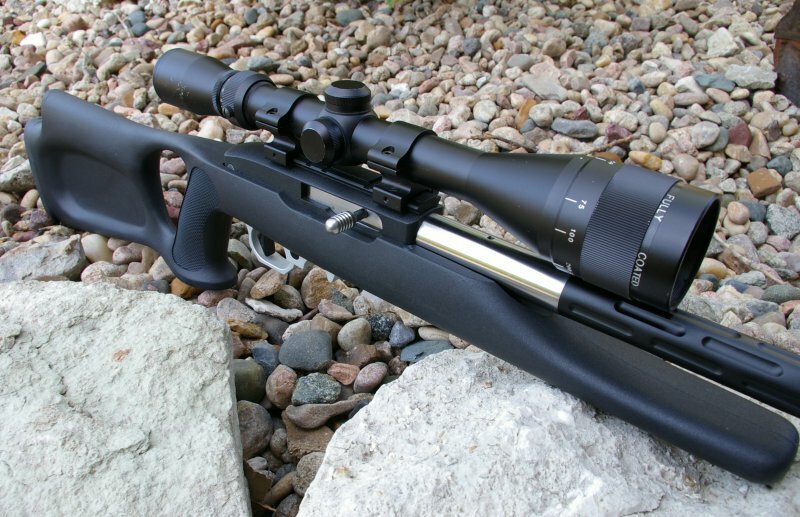 When paired with a stock Ruger 10/22 receiver, Glacier Ridge Stock and Simmons 6-18 Prosport Scope the build came in at $1177. Sure there are less expensive routes to sub-.25” 50-yard groups, however Volquartsen has never indicated they were ever the least expensive, just the best. The fit and finish is superb. Every piece seems like it belongs in the Modern Art Museum. There are plenty of folks churning out 10/22 parts, however the Volquartsen parts are in the super premium category of fit, finish and feel. Every part was perfect. 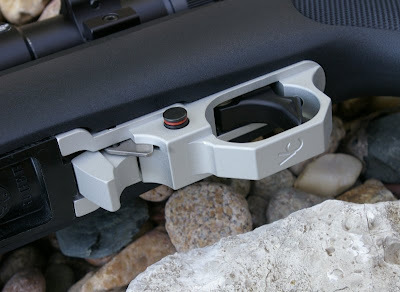 Stylistically, there is not one 10/22 option out there that has the style and look of a Volquartsen part. Volquartsen THM Tension I-Flute Lightweight 10/22 .22LR barrel - $286 MSRP - I am pretty sure they did not pioneer the sleeved and tensioned 10/22 barrel, however they certainly are the ones that turned the idea into an art form available to the masses. 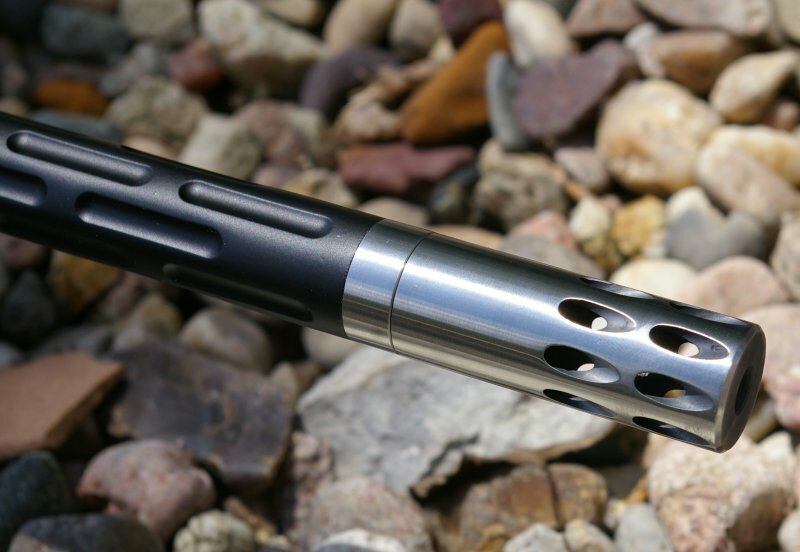 The THM I-Flute barrel is essentially a Lothar Walther barrel which has been profiled to a chamber neck area and then steps down to a barrel liner profile. A stiff sleeve, in this case an aluminum alloy, it secured over the liner. 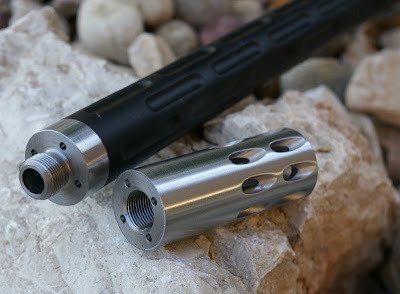 At this point the barrel is technically a sleeved 10/22 barrel similar to those from Beyer, Tactical Solutions, or Whistelpig however a tensioned barrel adds some additional engineered stiffness. 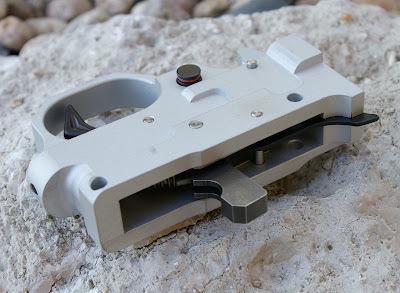 A tensioning nut presses against the sleeve adding tension to the barrel which in theory creates a stronger and stiffer barrel. Having owned a few tensioned barrels, they are consistently some of my best performing barrels regardless of weight. One of the most notable features of the barrel is the weight which is about 1/3 the weight of a comparable bull barrel. I think there is a place for long heavy bull barrels, which is called a bench. However, if you plan on walking around, hunting, or standing, or otherwise supporting the gun with only your appendages, then a light barrel becomes a friend quickly. 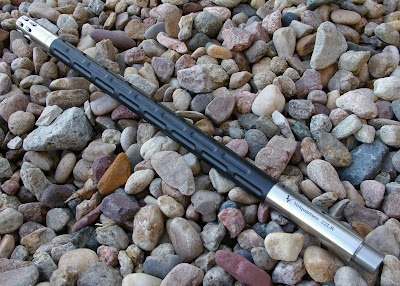 Another notable advantage is delivering a 10/22 option for youngsters who simply do not have the upper body strength to support a heavy bull barrel in a shooting/hunting situation. Volquartsen’s famous accuracy is delivered via the Lothar Walther barrel blanks and a Benz style match chamber, but is enhanced via Volquartsen’s chambering, crowning, chamber reaming, precision turning and in this case, tensioned barrels. Of note this is a precision barrel with a match chamber so it is not recommended that you shoot extended case rounds such as the CCI stinger. It will chamber and shoot them, however you will likely damage your chamber/rifling in the process which will impact accuracy negatively. The company offers a rainbow of smooth sleeved barrel colors, however I opted for the black custom I-Flute barrel which is noted to save a little weight. 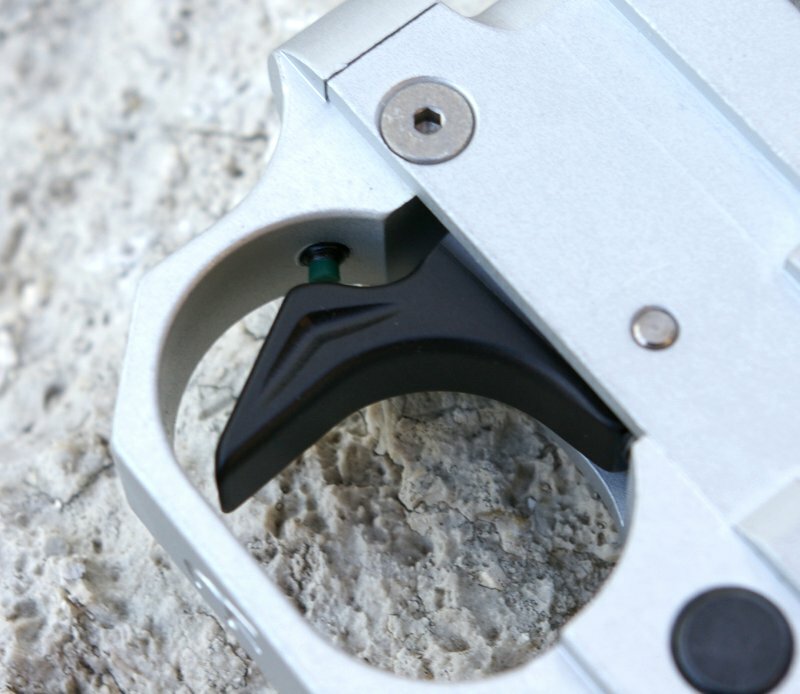 It is also a stunning looking barrel that turns heads with the Forward Blow Compensator installed. 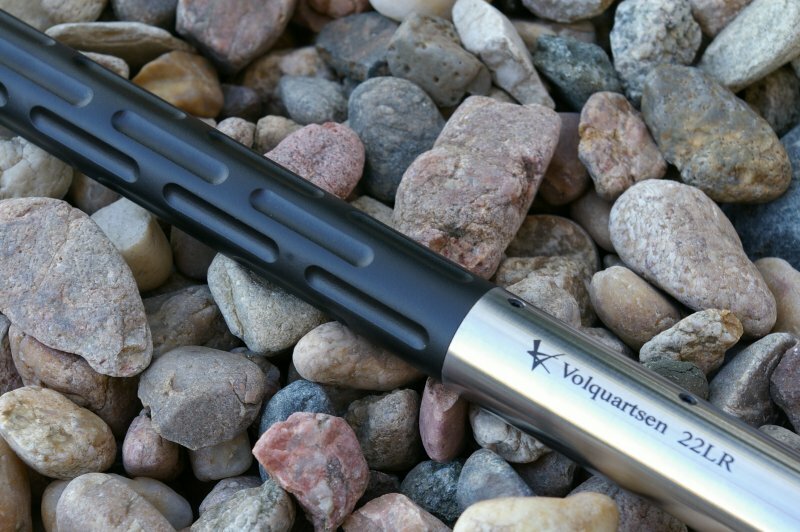 Volquartsen Forward Blow Compensator - $102 MSRP - The .22LR round hardly needs a compensator and many would argue that there is simply not enough powder-burn-volume to even make it operate effectively, however it does help some, protects the crown from damage and looks way cool. In this case, is added a really nice custom touch to the barrel and did decrease muzzle rise a bit while decreasing the noise to the shooter. 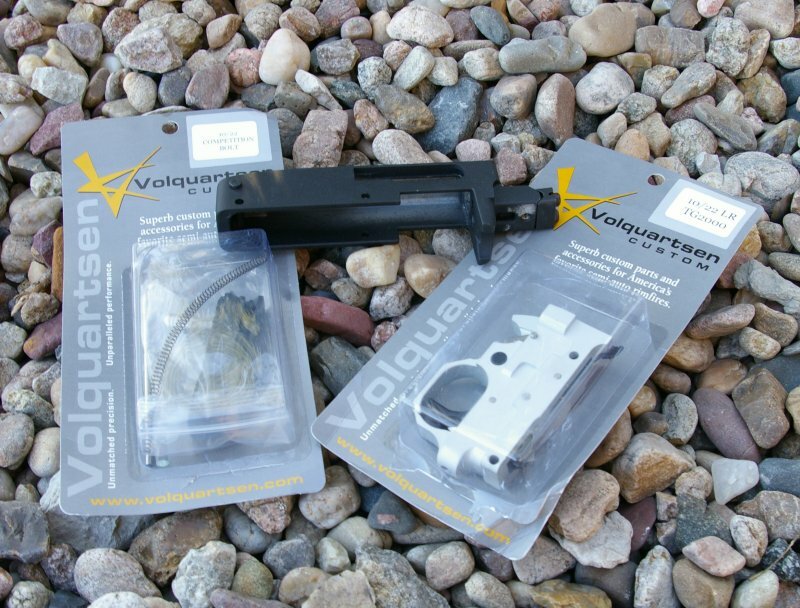 Volquartsen TG2000 10/22 Competition Trigger - $260 MSRP - Unless your existing trigger is truly an abomination, a trigger upgrade is second only to the barrel as an accuracy increasing upgrade. Volquartsen has a whole host of upgrade parts for the stock 10/22 trigger assembly, however I opted to go for it with a full trigger unit. Like the barrels they are available in a rainbow of colors, however I stuck with silver to maintain the black and silver build theme. The trigger assembly delivers a crisp, clean 2lb trigger pull, with shooter adjustable pretravel and overtravel adjustments. I felt the trigger was perfect out of the box for a fieldable gun, however match shooters may want to fiddle with those settings a bit. 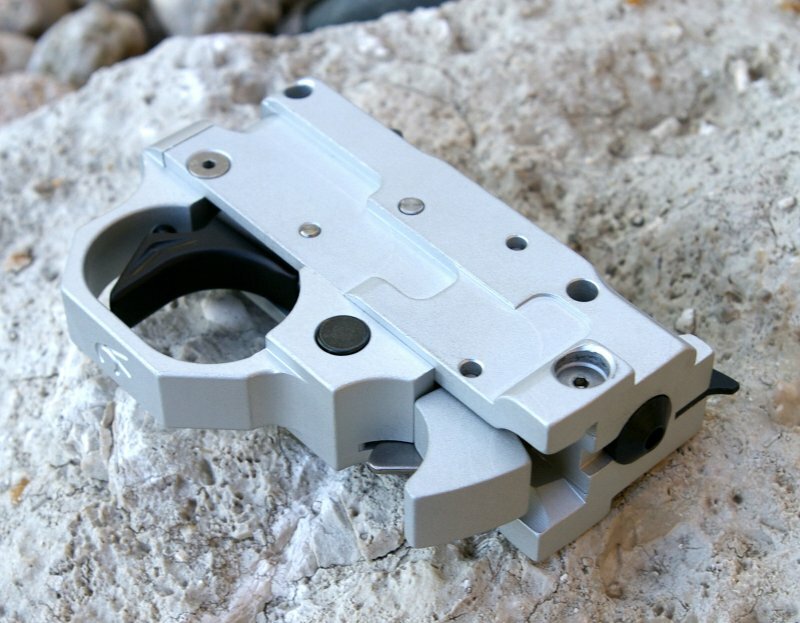 The TG2000 trigger assembly is 100% Volquartsen internals paired with their own trigger housing design CNC machined from high strength solid billet aircraft aluminum. 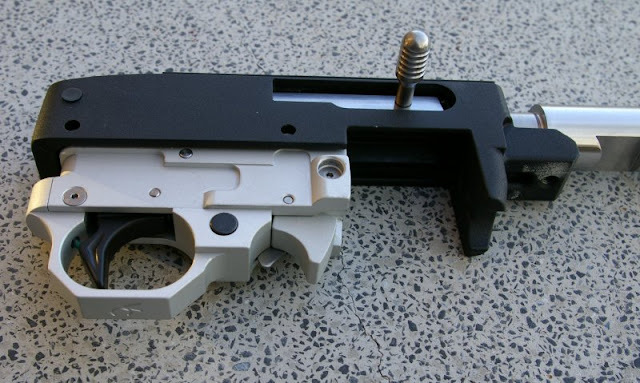 Its factory assembled, ready to drop in, and has all the cool features/upgrades we have come to expect on high end 10/22s including the automatic bolt and extended magazine releases. Volquartsen CNC Machine 10/22 Bolt Group - $235 MSRP & Recoil Buffer $11.30 MSRP - After barrel and trigger upgrades, a machined precision bolt, extractor, and firing pin are next on the list. This upgrade delivers more precise ammo handling which leads to more consistent chambering and accuracy. This in itself is not a huge accuracy gainer, but it does enhance accuracy. Where I see the biggest advantages are an improved Volquartsen round firing pin and extractor which deliver improved ignition and less issues with extraction. 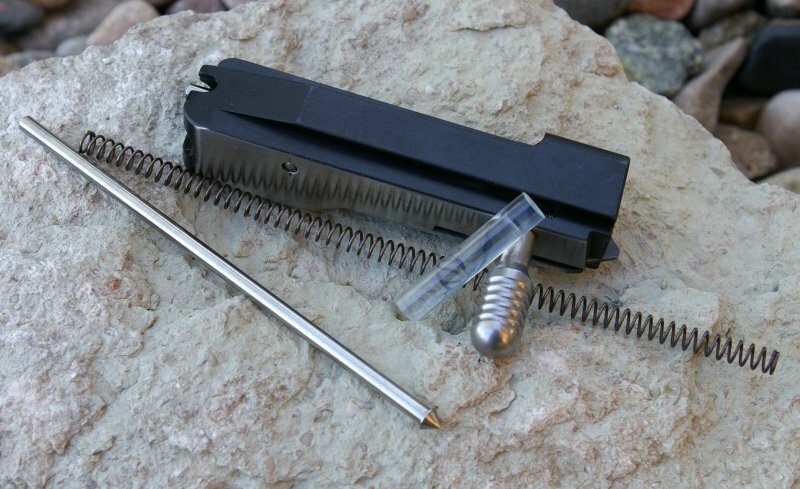 The recoil buffer is a small upgrade, however it does seem to deliver a quieter cycling 10/22. Of course the bolt itself and the charging handles are again worthy of a museum exhibit. Volquartsen did not disappoint. My largest 50-yard group was .698” with Winchester 555 Bulk ammo with my smallest 50-yard group being .131” with Lapua Center X. Even at its most inaccurate it was still far more accurate than the best a good shooting stock tweaked/recrowned barrel. On the tiny group side, this Volquartsen is stunningly accurate delivering groups step for step with my Kidd and Feddersen builds. Considering Volquartsen is using the same Lothar Walther premium .22 match blanks as Kidd, I would expect nearly identical accuracy. I even managed my 50-yard playing card spitting trick with this rig. Although pretty much anything from Lapua delivers outstanding accuracy, the CCI Standard Velocity rounds delivered extremely consistent .25” 50-yard groups, but these days it may be easier and cheaper to get the more expensive Lapua. For the full comparison to all my other builds, take a look at my Google Docs Ultimate 10/22 Shootout accuracy results spreadsheet. I own about a dozen 10/22 in various customer configurations, in fact I have probably dedicated more time to testing 10/22s parts and accessories than any other writer on the planet. Of note is my extensive Ultimate 10/22 Shootout (MajorPandemic.com) where I compared the ins and outs of each brand. That said, Volquartsen remains up there in the top slot or at least tied with Kidd. Where Volquartsen blows everyone away including Kidd is maintaining that quality across the huge diversity of 10/22 and other firearm products. It is truly stunning how many options they have available; each and everyone one is gorgeous. Although this may look like a tricked out race gun, the ergonomics of the Glacier Ridge stock paired with the accuracy of the Volquartsen action and barrel delivers a perfect rifle for small game hunting and pest removal. 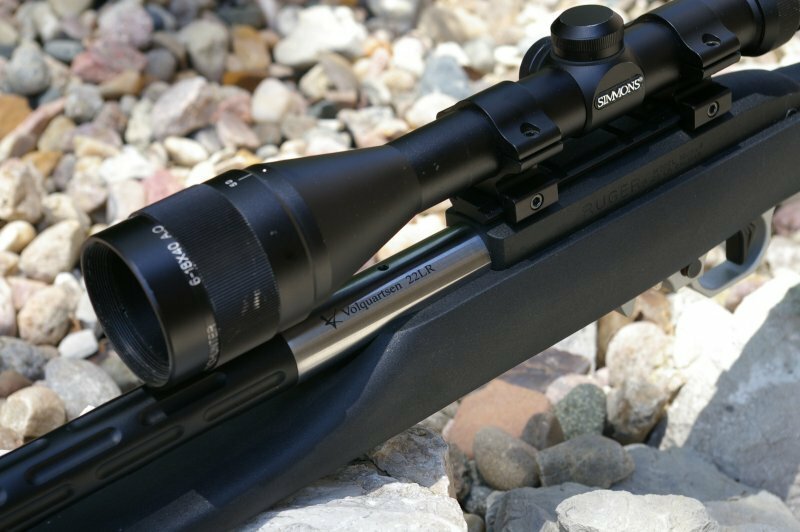 The used 6-18 ProSport Simmons scope is a great option to wring out the accuracy of the barrel while still maintaining a usable magnification for offhand shots. All around this is a great shooting rig. From an accuracy perspective the Volquartsen build is equal to the reference accuracy standards set by my Feddersen and Kidd builds. The net of this superb accuracy, quality and design is that you will not only match shot for shot with the best 10/22s on earth you will look better doing it. With only few critical pieces from Volquartsen this build performed exceptionally and it is understandable why the have a legendary reputation in the 10/22 market. I love reading your posts. You know, a lot of people are hunting around for this great information; you could help them greatly by your post.